[feature_headline type=”left” level=”h3″ looks_like=”h3″ icon=”bolt”]Electrical Muscle Stimulation[/feature_headline][text_output]Electrical muscle stimulation (EMS), also known as neuromuscular electrical stimulation (NMES) or electromyostimulation, is the elicitation of muscle contraction using electric impulses. EMS has received increasing attention in the last few years, because it has the potential to serve as: a strength training tool for healthy subjects and athletes; a rehabilitation and preventive tool for partially or totally immobilized patients; a testing tool for evaluating the neural and/or muscular function in vivo; a post-exercise recovery tool for athletes. 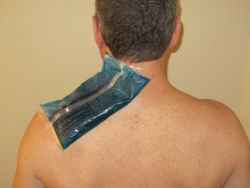 [feature_headline type=”left” level=”h3″ looks_like=”h3″ icon=”minus”]Ice Therapy[/feature_headline][text_output]Also known as Cryotherapy or Ice Pack Therapy is used to decrease cellular metabolism, increase cellular survival, decrease inflammation, decrease pain and spasm, promote vasoconstriction, and when using extreme temperatures, to destroy cells by crystallizing the cytosol.